On Monday, May 7, President Obama appointed two new Commissioners to the Federal Communications Commission (FCC). The FCC is an independent agency of the U.S. government which oversees telecommunications, media (including broadcast radio) and other important sectors. In recent years, the Commission has sought to keep up with changing technology with regard to its regulatory policies (and not without controversy). FCC Commissioners are appointed by the president. Together the five FCC Commissioners, approved by the Senate, direct the FCC for 5-year terms. This means that their opinions help shape the issues under the agency’s purview, including matters involving the internet, media ownership, competition in the media, broadband access and more. It’s not always easy to see how these issues impact musicians, but they do. From preserving the level playing field that is the open internet, to ensuring that commercial radio doesn’t become any more of a corporate dead zone, the FCC’s policies can have a major effect on the entire music ecosystem. Which is why we pay attention when new leaders join the agency’s ranks. So who are these two new Commissioners? The first is Jessica Rosenworcel (D-Conn.). Rosenworcel served as Senior Legal Counsel for the Senate Committee on Commerce, Science, and Transportation beginning in 2007. She previously worked at the FCC in legal advisory positions, serving as Legal Advisor/ Senior Legal Advisor to Commissioner Michael J. Copps, Legal Counsel to the Bureau Chief of the Wireline Competition Bureau , and as an Attorney-Advisor in the Policy Division of the Common Carrier Bureau (1999-2002). Rosenworcel has spoken about the importance of adapting FCC policies to better reflect today’s technological landscape. She has also promoted the internet as a public good, while championing universal service and privacy protection. A fun fact about Rosenworcel: her brother is the drummer for the band Guster. Brian Rosenworcel is that crazy guy who forgoes a traditional drum set for a mixed lot of bongos, congas, djembe, hand snares and cymbals. We’ve always thought that this puts the artists ’ perspective close to home for Commissioner Rosenworcel — which is perfectly okay with us. President Obama’s second appointment is Ajit V. Pai. A fifteen-year veteran of the communications law and policy field, Pai has served in all three branches of government. He supports FCC policies that would give private firms more incentive to raise and invest capital, develop new products and services and to compete in the marketplace. We’ll have to see how that plays out. 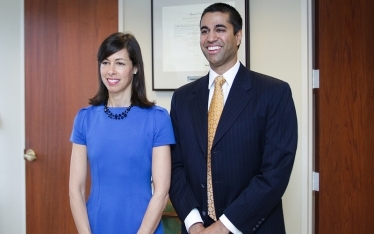 A graduate of Harvard University, Commissioner Pai earned his J.D. from the University of Chicago in 1997. He clerked for the Honorable Martin L.C. Feldman for the Eastern District of Louisiana, and later worked as Counsel to several Senate committees. Between 2007 and 2011, Commissioner Pai worked in the FCC’s Office of General Counsel. While in his capacity as Deputy General, he worked on transactions and regulations involving the wireless, wireline, cable, Internet, media, and satellite industries. Commissioner Pai also spent time in private practice at the DC office of Jenner & Block LLP and as Associate General Counsel at Verizon Communications, Inc. These appointments could be a big deal for musicians and fans. Considering the FCC regulates broadcast, radio, broadband (sort of), the wireless spectrum and media in general, their decisions will ripple throughout the music community, whether people realize it or not. Once again having a full leadership deck means there are more perspectives when deciding issues, and more staffing power to provide research in areas of proposed change. This allows for a more thorough deliberation on issues from net neutrality to broadcast regulations to spectrum allocation. More research means more knowledge, and knowledge is power (or so we hear). We’d like to offer our hearty congratulations to both Commissioners for their appointments. Now get to work!